Hair, hair, hair. I feel like it's been a long while since I've done a hair post! Over the past 20months blogging I've tried extensions, hair pieces and countless amounts of products but today I have something brand new to me to share with you! 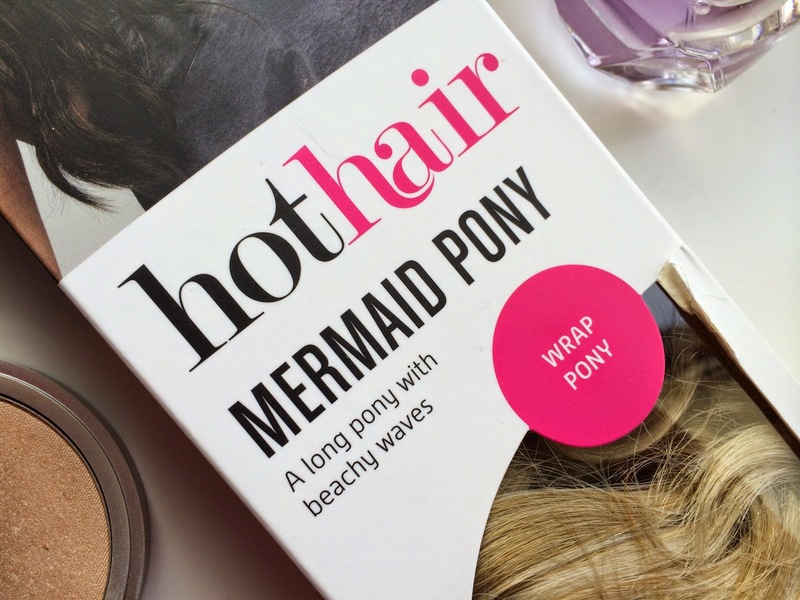 Hot Hair is a UK hair brand selling everything from extensions to wigs and I was really excited to be contacted by them and asked if I wanted to try out one of their popular ponytails! I had actually been looking at buying a product like this a few months ago, I see so many celebritys wearing them and they seemed like such a quick and easy way to get a glamorous up-do in seconds! 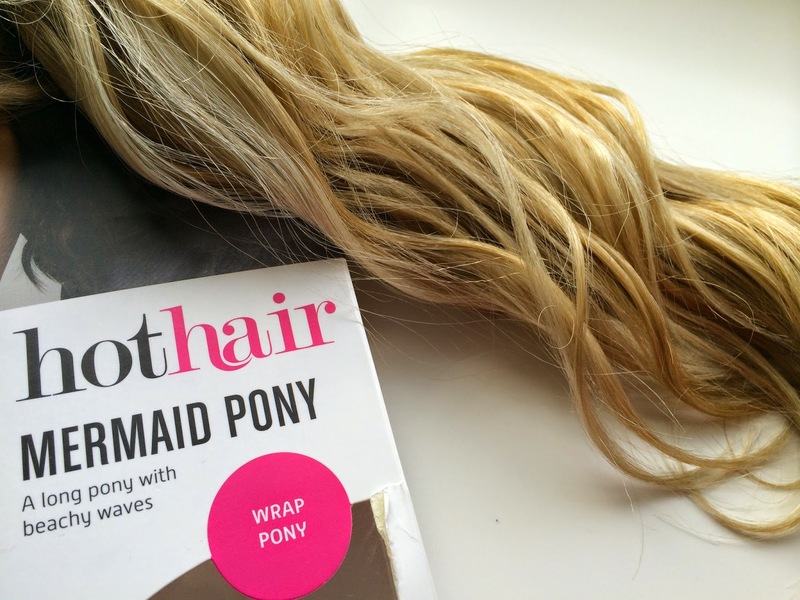 After looking through the site I decided to get for the mermaid pony. The name 'mermaid' had me sold and I liked the look of the soft waves - alot more natural looking than a poker straight or overly curly. The shade choosen for me was - Creamy Twist . I was a little nervous about choosing a shade as I has recently had my hair dyed slightly differently with a few darker blondes tones put through but I have to say though it was a great match! 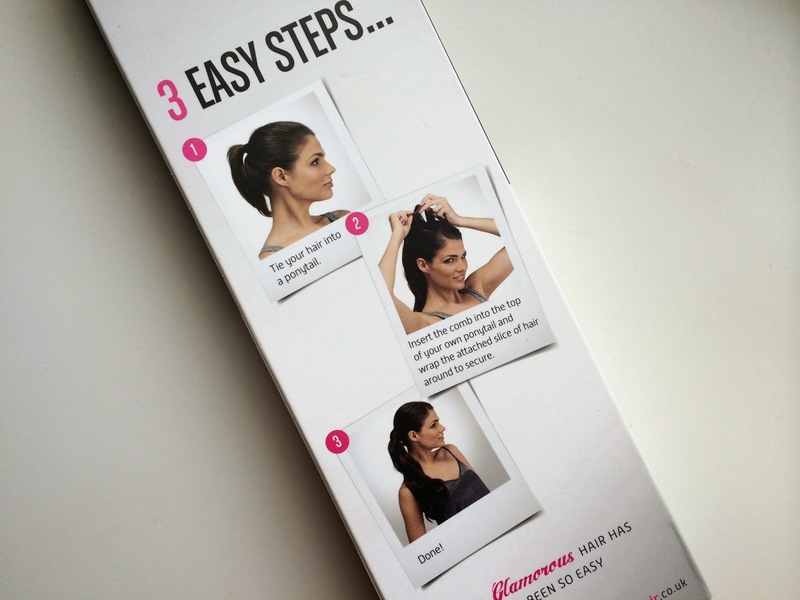 Yes that picture is correct - it only takes 3 simple steps to get your normal plain Jane hair looking thick and fab! 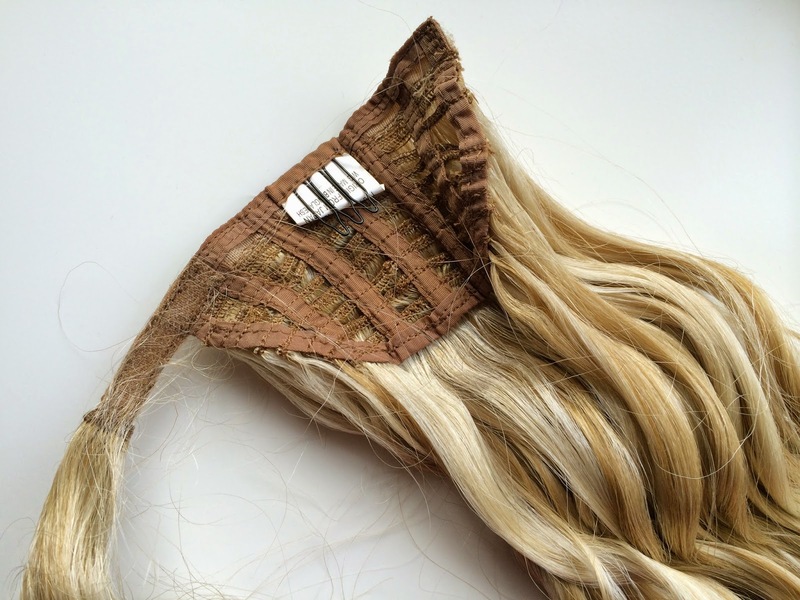 The comb slips into the top of your own ponytail and then all you have to do it wrap the attached piece of hair around the top to secure the piece and create a natural look! I found this piece super easy to use. As you can see below I tried it in several different ways, my favourites being a low side pony and a standard high pony! I was worried that the hair would look super synthetic but once in it does blend alot better than I was expecting! If you have thick-ish or similar length hair you may want to straighten it to make it thinner so it's easier to hide inside the piece, or style your hair in same style as the piece to help blend it! Make sure you have a few hair grips handy. The wrap around piece has velcro but also needs help being made secure but just a few hair grips has it done in seconds. 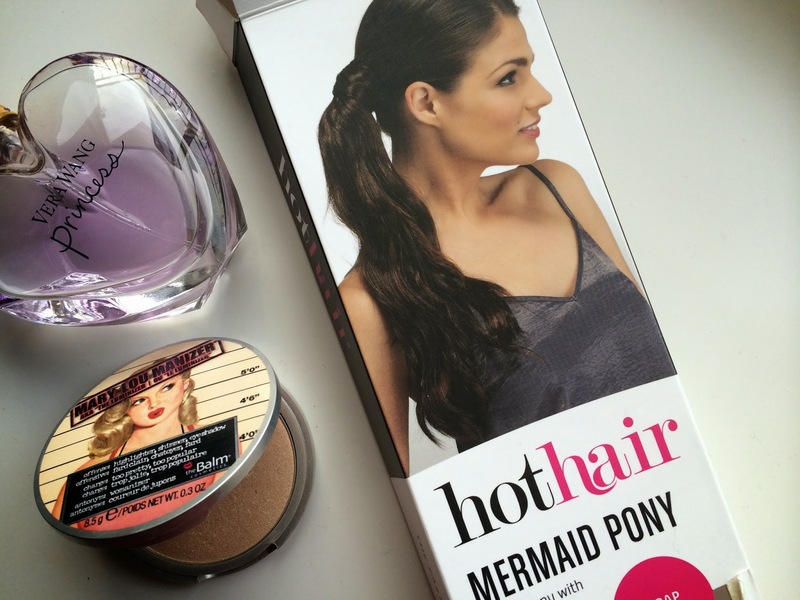 The Mermaid Pony is normally £25 but it's actually on offer at the moment for only £20 - here! What do you think? Have you tried out any products like this? Thank you Hot Hair I can't wait to wear this more! That color fits you great! It looks great. I've cut had a major hair cut, so something like this would be perfect for when I want my hair to look longer. This is lovely and makes me want to try one as well. I just cut my hair short and miss my mermaid hair up in a ponytail so this might be my solution. I'll be sure to check them out and lovely post! That looks so pretty on you - it's such a natural colour. discount ray ban sunglasses cheap suddenly cheap ray ban sunglasses some hate their abilities, if it is a man, this time you will not see cheap eyes, their discount ray ban sunglasses cheek suddenly cheap ray bans two men may be able to bridge the gap created. However, this time clearly see clearly, so the air seems solidified, it seems that each of the two in the middle of a mountain, discount ray ban sunglasses cheap ray ban sunglasses looking not only can climb, and more insurmountable. Aiming to attract more women to the brand, air max pas cher Under Armour unveiled ads last year featuring ballet dancer Misty Copeland and Brazilian supermodel Gisele Bundchen. But Under Armour said it has nike air max pas cher no plans to write local athletes or actors out of its scripts. Company officials say area scenes simply feel genuine. Under Armour has often used Producers, 2015 nike air max pas cher a Baltimore video production company, for its ads.